The day we arrived in New York we had planned on trying to spend the afternoon doing a boat tour around Manhattan Island. We figured it was something that would give us an overview (at least of things you can see from water) and something that wouldn't tax us too much coming off a red-eye flight. Because we were delayed several hours, that wasn't going to happen then, but we did have the opportunity to do so this morning. The cruise started at 10am, but we've heard that the lines could get long. We showed up a bit less than an hour ahead of time, and there were no lines. We walked right onto the boat and there weren't that many people onboard. We went up to the top and staked out seats towards the middle (figuring there would be sights on either side). We set sail and proceeded south for a cruise which would keep Manhattan on the port side. 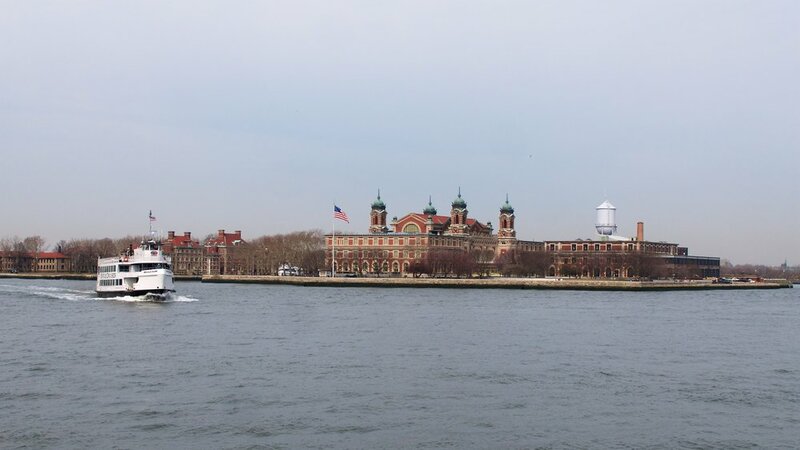 We quickly got good views of Downtown, followed by Ellis Island. 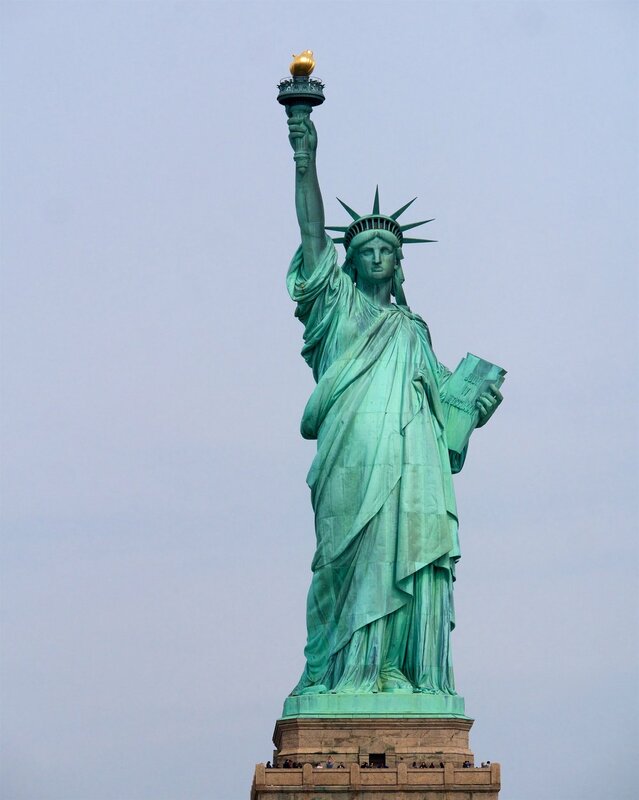 Knowing the Statue of Liberty would be the most popular sight, the boat goes past it, turns around, and goes back so it can be seen on either side of the boat. Not that it really mattered; people all flocked to whatever side it was on. After rounding downtown and making our way to the East River, we soon got to Brooklyn and went under the Brooklyn, Manhattan, and Williamsburg Bridges. Views of the Empire State Building and the Chrysler Building were next, soon followed by the UN. We went right next to Roosevelt Island then Wards Island to the Harlem River, then got our first views of the Bronx. There was a pretty good view of Yankee Stadium, and then we got to bridges which had much less clearance. The narrator told a story of a couple guys who jumped off chairs to try to touch the low-clearance Broadway Bridge. Apparently, they succeeded and hung on, only to have the boat continue to move under them, leaving them hanging over the water. The boat returned to pick them up. 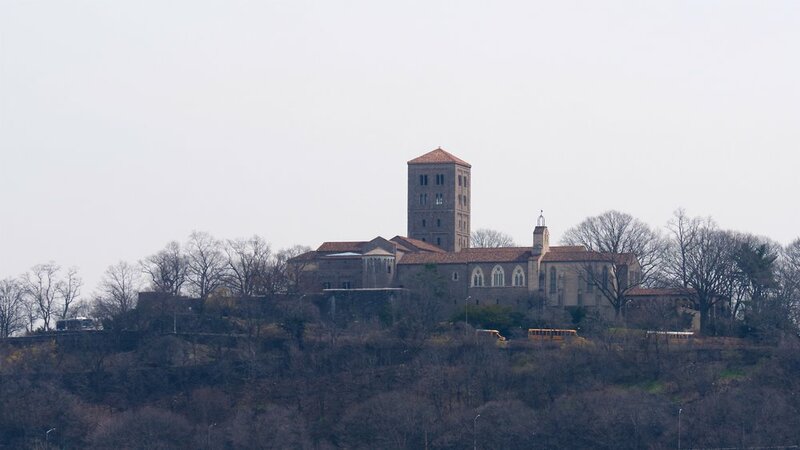 Returning to the Hudson, we went right past the Met Cloisters. When we passed Grant's Tomb, the announcer told the story of Ulysses Grant in New York and how Mark Twain helped him with an autobiography. The next story was about US Airways Flight 1549, the one where pilot Chesley Sullenberger landed the plane on the Hudson. Before docking at the end of the 2½ cruise, we swung around the USS Intrepid aircraft carrier which is now a museum. They also have a Concorde, a Space Shuttle, and a submarine. When we checked into the hostel, the woman gave us a list of suggested restaurants, both in Harlem and around the city. One of them was a pie shop, which happened to be only a few blocks away from the pier. 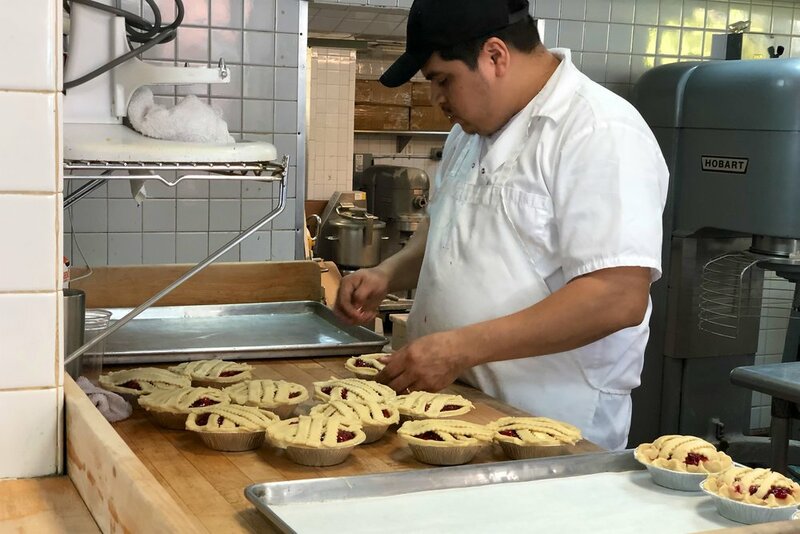 We walked over and split a chicken pot pie and a strawberry rhubarb pie. Both were really good. Right next to us they were assembling other pies; cherry when we got there, strawberry rhubarb when we were leaving. We had a couple hours before we were going to meet up with Celeste for a walking tour through Chinatown, so we looked for a place to hang out before that. One of the places on the tour, Kam Hing Coffee Shop, is known for its sponge cake, so we went there and Melody also got tea. The sponge cake was 75¢, and it wasn't huge, but larger than we expected. There was a sign asking patrons to only use tables for 15 minutes, but we pushed that since there were still empty seats. The length of the line grew and shrank, but most people seemed to get things to go. It finally got to the point where the people who sat down before we did were getting up to leave, so we wandered out. There was still a bit of time before Celeste would arrive, so we went to the first stop, the Museum of Chinese in America, and looked through the gift shop, then sat down for the few minutes before she showed up. As you know, we try to find walking tours to give us an idea of highlights of an area, so it would be no surprise that we followed a Chinatown walking tour. We made quick work of the museum (since we already looked around, but chose to not go in the museum itself) and the bakery, so our first stop was the Mahayana Buddhist Temple. It's quite large, situated right near the Manhattan Bridge Arch and Colonnade. We went inside, donated $1 each for a fortune (mine said I would be journeying on a spaceship) and looked around. Taking a quick look at but otherwise bypassing, we immediately went into the Chinatown Ice Cream Factory. There were a few dozen flavors, and we settled on mango and egg custard (but ginger and red bean were tempting). Sun's Organic Tea Shop was next, and the small space was filled with shelves of jars which contained (surprise!) all sorts of teas. The Yunhong Chopstick Chop had some really nice chopsticks, many which I would have though are more Japanese in style. Only a few more stops. The Church of the Transfiguration has quite a past. It was begun by Dutch Lutherans, but the parishioners changed to Irish immigrants. Today it has the largest Chinese Roman Catholic congregation in the country. A block away was Columbus Park, where we saw buskers, basketball, young kids running around, and other people sitting and enjoying the day. 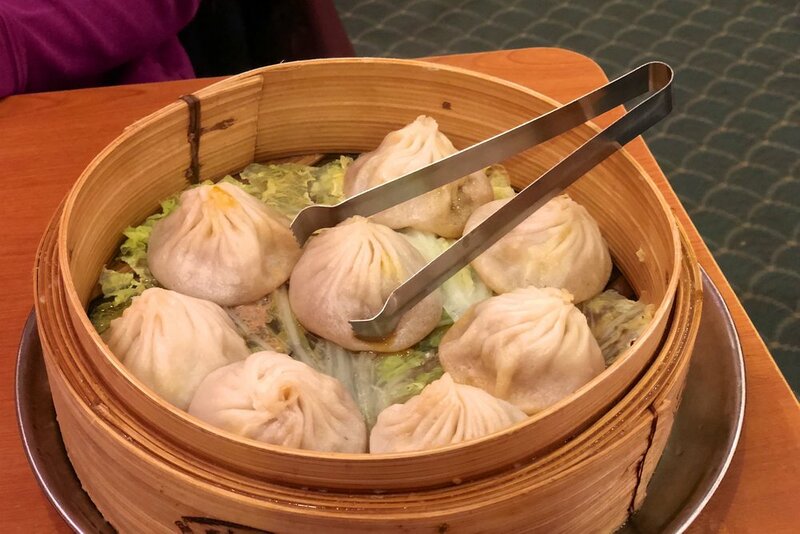 Last on the tour was Joe’s Shanghai Restaurant where we had to order their specialty, soup dumplings, opting for the ones with crab and pork. We also ordered mushrooms with bamboo shoots. Both dishes were really good, and plenty for the three of us. We gave Celeste tips on how to et the dumplings without losing all the soup, and she seemed to Lao enjoy them. That was enough playing tourist, so we went back to Harlem and called it a day.